We offer delivery of your pallets, euro pallets to any region of Ukraine as well as any foreign country. Cost of delivery is discussed individually. Long experience with the shipping companies allows us to organise a delivery of pallets, euro pallets for reasonable price from any warehouses of our company. If you are going to take your pallets by your own transport, pay attention to the following information in the table, which allows you to oragnise shipping of pallets effectively. Type of pallet Average weight of 1 pallet, (±10%) kg. Truck capacity: 90 in cubic meters, pcs. Truck capacity: 35 in cubic meters (Mercedes Atego, Man 81-63, Volvo FL6), pcs. 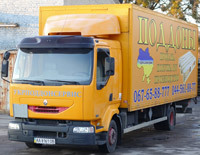 Truck capacity: ЗИЛ-130 , ГАЗ-53, pcs.